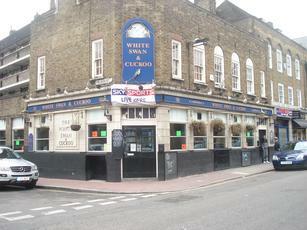 Pub number 2 of my small crawl of Wapping and it’s also my first visit here. Only Doombar on tap which I didn't fancy it so I went for a pint of Estrella, a decent pint but it’s lager and not my normal tipple! Half busy mainly locals and the pub’s fat ginger cat that was sprawled out by the fireplace. The pool table was popular and there was tennis from Wimbledon on the television that no-one was really paying attention to. Nice neutral decor, wooden floor through out. Not a bad pub, not modernised in anyway really so that’s nice to see as there’s so many pubs that have been modernised these days it becomes the norm. Perhaps the highest standard of karaoke anywhere in London. Heard a rendition of "Stuck in the Middle With You" (Stealer's Wheel, 1972) so pitch perfect I actually thought it was the original. Slightly hostile atmosphere at times in this pub, as I don't drink there regularly. I suspect it would be warmer if I did. The landlady is nice and keeps order (which I suspect she has cause to do at times). Elvis impersonators and I once went to karaoke there, though I don't know if they do that anymore. Shame about the decor - the blue makes me think of a public toilet.